The maps below explore the American Community Survey 5-year data (Table S1810) poverty estimates by disability. The ACS asks a set of disability indicator questions to determine disability. If a respondent can answer “yes” to any disability question they are classified as having a disability. The data below are for all age groups. This map of the United States depicts poverty rates among people with disabilities by county. The data includes people of all ages. Rates are broken into four categories ranging from 0.0 to 67.9%. 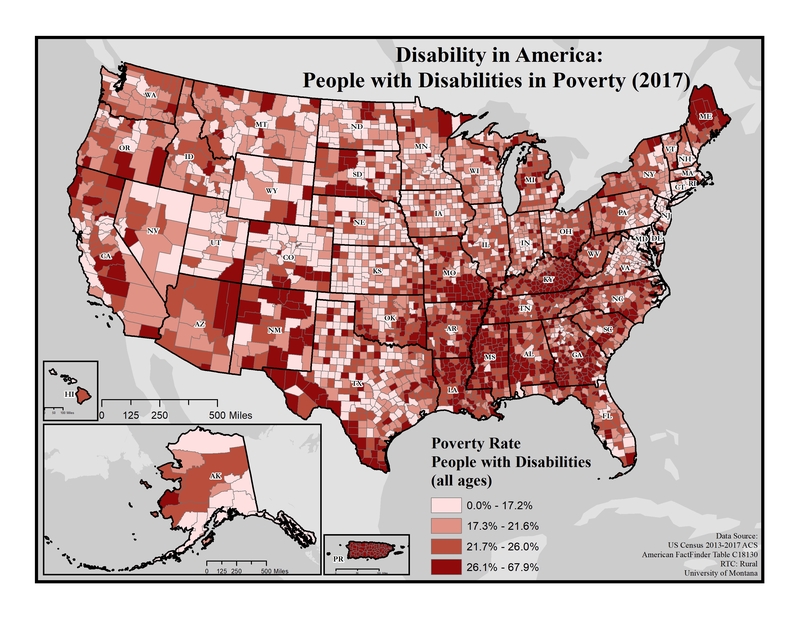 Poverty is more common (26.1 to 67.9%) among people with disabilities in the South, especially in eastern Kentucky and areas of Missouri, Mississippi and Alabama, as well as northern Maine. Poverty is generally lower (0.0 to 21.6%) among people with disabilities in the Great Plains and Midwestern states throughout the Rocky Mountain region and across Coastal New England and the Middle Atlantic. 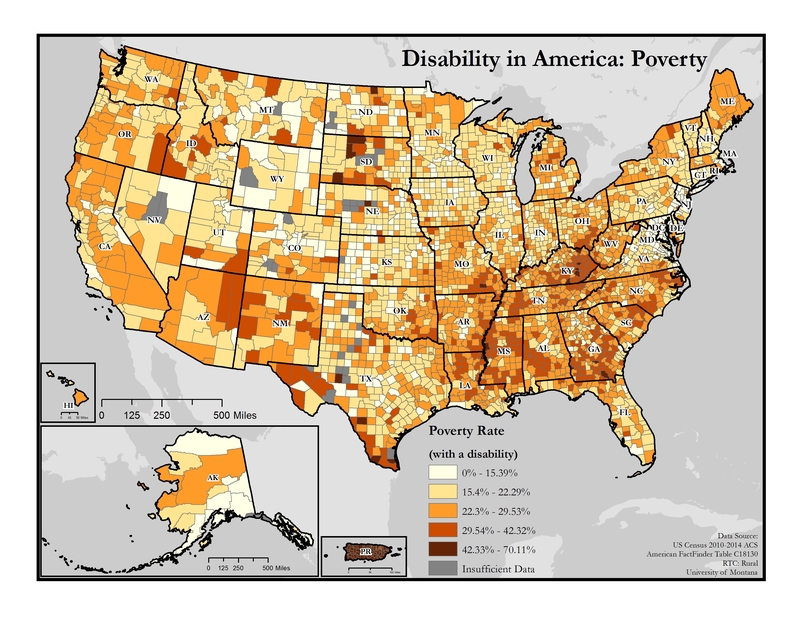 This map of the United States depicts poverty rates among people with disabilities by county. Rates are broken into five categories ranging from 0.0% to 70.23%. Poverty is more prevalent (30.16-70.23%) among people with disabilities in the South, especially in eastern Kentucky and select counties in western Texas, New Mexico, Arizona, and South Dakota. Poverty is generally lower (0.0-30.15%) among people with disabilities in the Great Plains and Midwestern states and throughout the Rocky Mountain region. 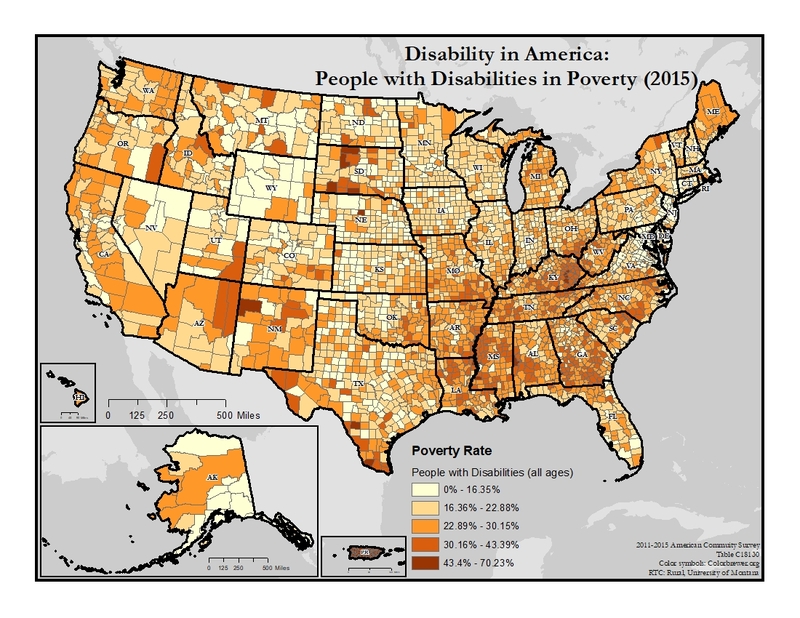 This map of the United States depicts poverty rates among people with disabilities by county. Rates are broken into five categories ranging from 0.0% to 70.11%. Poverty is more prevalent (29.54-70.11%) among people with disabilities in the South, especially in eastern Kentucky and select counties in west Texas, New Mexico, Arizona, and South Dakota. Poverty is generally lower (0.0-29.53%) among people with disabilities in the Great Plains and Midwestern states and throughout the Rocky Mountain region.